Congo’s Vita Club finished in second place in their Group A after playing to a one-all draw with home team and last year’s finalists Simba at the ongoing CECAFA club championships. The Msimbazi lions came from behind to earn the point but would have easily won the match if Felix Sunzu had converted a last minute penalty. In a well balanced match, Vita had the early opportunities and they had the opener in the 34th minute from the penalty spot after Juma Nyoso handled in the box. Taddy Etekiama stepped up and made no mistake from the spot. 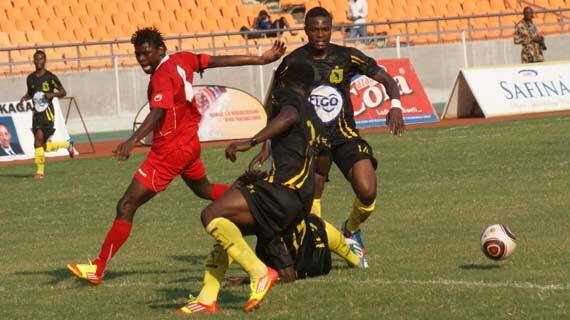 Simba then equalized in the second half through Harun Moshi who struck a wonderful volley from Mudde Musa’s cross. The former Sofapaka man had been employed by Coach Milovan Cirlovic as a more outward player as opposed to his holding midfield role. He had been doing well in bringing in the crosses. Salim Kinje made his first appearance in the CECAFA Kagame Cup for the Msimbazi boys coming in for Mudde Musa and was also employed on a wide role. Though he did not do much of running, he was always involved in the build up from the back. Zambian Felix Sunzu had a great chance to give Simba the three vital points and enable them to finish in second place, but the striker wasted a penalty after Tshimanga Mutamba had handled inside the box. Simba will now meet Azam in the quarters, a match that promises to be mouth watering.